Tomintoul - pronounced 'Tomintowel' - is Scotland's highest village and has become infamous for regularly being cut off due to heavy snow. The distillery was built in the 1960s and is modern in appearance, with large warehouses and no pagoda roofline. The wildness of the surroundings contrasts with the delicacy of the district's malts. Tomintoul has traditionally seemed the lightest among them in flavor, although it has a little more body than its neighbor Tamnavulin. 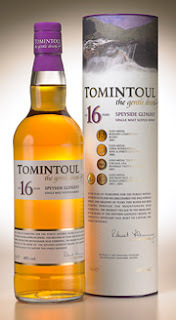 Part of a 3-pack of 50mL Tomintoul bottles that I purchased at Fortnum and Mason in London. I reported on the first bottle, the 10-year, here. Compared to the 10-year, the 16-year is the wild child older brother. Where the nose, palate, and finish of the younger whisky was as mild and inoffensive as some blended whiskies, the 16-year was hot stuff. Peals of grains and wild vegetation push the sherry into the background in the nose and flavor. The wet hay finish felt warm and lovely. It has a thin texture like its brethren and a color of light honey. The only thing disappointing about the drinking experience was that the little bottle only held 50mL! There was actually a lot of other flavors zipping around that I couldn't really catch. Thusly this is at the top of my list of additions to The Liquor Cabinet. The pricing is very reasonable considering that it's only $8-10 more than the 10-year and it's at least twice (not real math) as good. As a Speyside it's mellower than an Islay or Island whisky, yet it's more exciting and complicated than many bestsellers from its region.